Learn how to determine the COD in waste water to know the pollution quantity in water by the titration method using Ferrous ammonium sulfate and Ferroin solution as indicator. Chemical oxygen demand (COD) is used to determine the quantity of pollution in water after wastewater treatment. The higher value of chemical oxygen demand indicates the higher organic pollution in the water sample. Only chemically digest able matter can be determined by the COD test. COD determination takes less time than the Biological Oxygen Demand test. COD is recommended where the polluted water has toxicity and organic matter can’t be determined by biological oxygen demand and useful in water effluent treatment plants. The organic matter, present in the water sample is oxidized by potassium dichromate in the presence of sulfuric acid, silver sulfate and mercury sulfate to produce carbon dioxide (CO2) and water (H2O). The quantity of potassium dichromate used is calculated by the difference in volumes of ferrous ammonium sulfate consumed in blank and sample titrations. The quantity of potassium dichromate used in the reaction is equivalent to the oxygen (O2) used to oxidize the organic matter of wastewater. Add 6.13 gm Potassium dichromate (previously dried at 105 °C for at least two hours) into 800 ml distilled water. Shake the flask well to dissolve the content and make up the solution to 1000 ml and mix well. Dissolve 10 gm Silver sulfate (Ag2SO4) in 500 ml concentrated sulfuric acid and make up the solution to 1000 ml swirl the flask to mix well. Allow standing the solution for 24 hours before use. Dissolve carefully 0.1 gm of HgSO4 in 5 ml of concentrated Sulfuric acid. Dissolve 9.8 g ferrous ammonium sulfate in a solution of 100 ml of distilled water and 20 ml concentrated Sulfuric acid. Cool the solution and make up the solution to 1000 ml of distilled water. Standardize the solution to determine the actual concentration to calculate the chemical oxygen demand. Add 3.5 gm of Iron Sulfate heptahydrate and 7.5 gm of Phenanthroline monohydrate to 400 ml of distilled water. Mix well to dissolve and make up to 500 ml of distilled water. 1. Take 10 ml of sample into a round bottom reflex flask. 2. Add some glass beads to prevent the solution from bumping into the flask while heating. 3. Add 1 ml of Mercury sulfate (HgSO4) solution to the flask and mix by swirling the flask. 4. Add 5 ml of Potassium dichromate (K2Cr2O7) solution. 5. Now add slowly and carefully 15 ml Silver sulfate- Sulfuric acid solution. 6. Connect the reflex condenser and digest the content using a hot plate for 2 hours. 7. After digestion cools the flask and rinses the condenser with 25 ml of distilled water collecting in the same flask. 8. Add 2-4 drops of ferroin indicator to the flask and titrate with 0.025 M ferrous ammonium sulfate solution to the endpoint. 9. 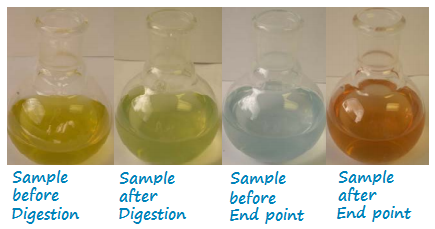 Make the blank preparation in the same manner as sample using distilled water instead of the sample. Dilution factor will be 50 because sample is diluted 50 times. Titrate the distilled water with FAS as blank and note down the reading. 10 ml as sample solution. No standard value for blank test. Blank test value shall be deducted from sample test.